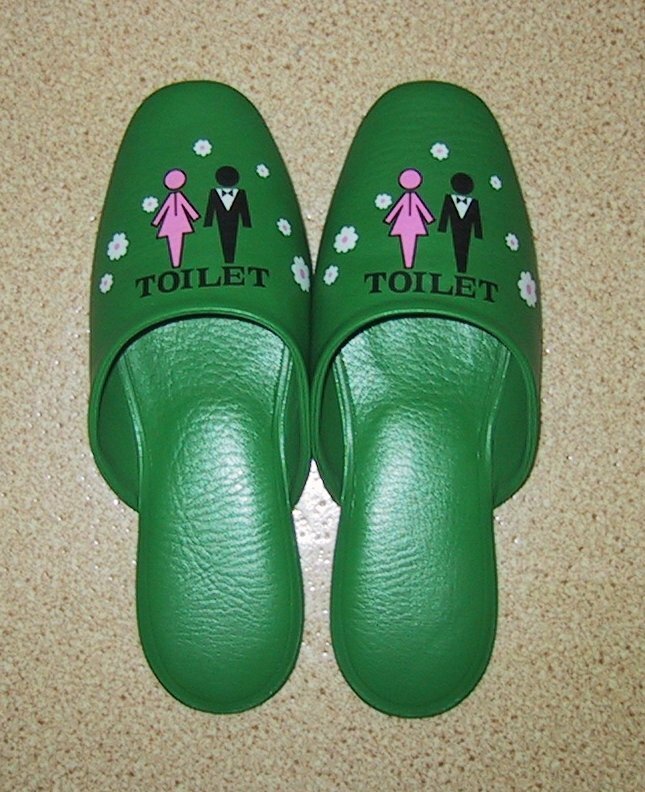 Now, the very first rule of Japanese toilets in private homes is that you do not wear your regular slippers inside the bathroom. You will find a pair of 'bathroom' slippers inside the door. Be sure to step out of your 'house' slippers and leave them outside while stepping into the 'bathroom' slippers inside. There are a couple reasons for this. First, it lets people know that the bathroom is occupied. And, second, it prevents you from tracking bathroom germs throughout the house. As you step out the door, (you should do this backward) step out of the bathroom slippers inside and step into your house slippers outside the door. Got that straight? It's a huge faux pas if you do it wrong. 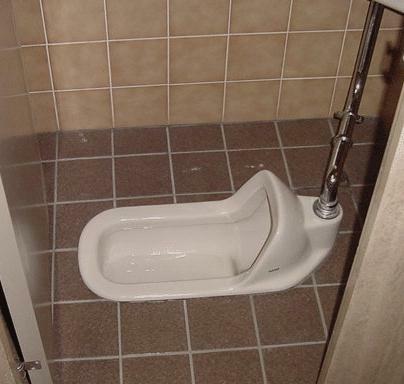 The toilets in Japanese homes are generally the same as the ones you and I are used to, but that is not always the case in public places. Many public restrooms, especially those frequented by tourists, have one or two stalls with western toilets, but the rest are traditional "squat" toilets. This toilet is simple for the guys to urinate in, but anything else requires that the user squat down facing the 'hood'. If your knees are in good shape and you are lucky enough to find toilet paper within reach - no problem. If you are really stuck, you can always grab that pipe in front of you to pull yourself up. Think about the workout your knees would get from doing this all the time. This is an innovation that I loved! It can be found on some squat toilets as well as on some "regular" toilets. After you've taken care of your business and you flush the toilet, you will find a small sink on the top of the tank with a spout of water where you can wash your hands. The water drains out of the sink and into the toilet tank for the next flush. Very environmentally conscious and apparently quite traditional since I found it on so many of the old squat toilets. 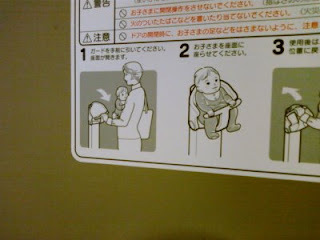 Something I really appreciated and wished we had in the US, was the baby seats built into many public restroom doors or walls. Ever tried to unzip your pants and pull them down and then back up while holding a baby in your arms? You certainly can't set them on the filthy floor! When you are done, just stand up; the toilet will flush intself! I loved my sojourn in Japan. It was fun to try to puzzle out things that just made no sense at all to me. Eventually, I had friends that I could ask, but they often didn't have answers either. If you have traveled somewhere and discovered other fun things that really got you wondering, I'd love to hear about them. I started this blog in early February and originally included travel posts. After all, travel is one of my favorite things about being retired. But in March, I thought that maybe my travels should have their own blog, so I started Kathy's Travel Tales. Now I'm having second thoughts again since it is so much more work to maintain the two separate blogs. So, starting with this post, I am bringing the travel tales back home. I don't know of a way to move the old posts over, but there aren't many, and they will still be available on the other site. But who knows? I just might figure it out tomorrow. If you think I'm making a crazy mistake, don't hesitate to tell me why. Really, I need advice here. I'm pretty sure there is a way to transfer your old posts from the other blog, but I'm too new at this to know how it is done. Lots of info on the web though. I was captivated by your toilet post. Who knew? Will save you to my favorite blogs and keep following. You can check me out at suzanneandmalcolm.blogspot.com. We are retired and living in Florida. As to your question about combining your blogs, I think it is important to understand what purpose you wish to serve. Are you trying to entertain, inform or just chronicle your adventures for your own enjoyment? Best of luck. I'll stay tuned. Thank you! I have a feeling that I might be able to do it by just copying and pasteing. I'll try it in a little while. Yes, I will definitely check out your blog. My goal re: the travel posts is to encourage retirees to travel. I had thought that others might enjoy it, too, but my target audience is baby-boomers planning retirement or already there. As I found by googling myself this morning, they all get their own listing, anyway.